In the late ‘60s, the average annual income for women was about $6,000. Black women were earning less than 80 percent of that. While women still face gender and race discrimination, it can’t be denied that we’ve come a long way. Developments like Roz Brewer becoming the first black female CEO of Sam’s Club this year show the progress minority women have made. In honor of Black History Month, recognizes three inspirational women who overcame innumerable odds at work – and helped the women of today succeed. hair, Walker created her famous Wonderful Hair Grower product and went on to become the first black female millionaire. She inspired women like Lisa Price, who founded Carol’s Daughter in her kitchen in the early ‘90s. The natural beauty line is now a multi-million dollar franchise. Leandra Abbott became the first black staff member of Cosmopolitan Magazine in the late ‘60s. She later reported on civil rights issues for Newsweek. Following in her footsteps is Amy DuBois Barnett, the first African American in the country to head a mainstream publication when she became editor-in-chief of Teen People in 2003. She’s now editor-in-chief of Ebony Magazine. Shirley Chisholm was the first black congresswoman and the first female to vie for the Democratic presidential nomination. In the early ‘90s, Condoleezza Rice became the first African American (and first female) to be a senior academic administrator of Stanford University. She then went on to be the first black female Secretary of State. 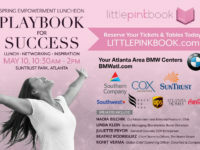 Bonus PINK Link: Check out Little PINK Book CEO Cynthia Good’s blogs on celebrating women of color.